We are delighted to offer two pairs of tickets to our Ireland on Sunday screening of Dieter Auner’s Off The Beaten Track this Sunday, July 1st at 1pm! Simply answer the question below and submit your name and email before 4pm Friday, 29th June 2012. The winners will be announced and notified by email by 6pm that day. Good luck! Off The Beaten Track, directed by Romanian-born and now Galway-based Dieter Auner, chronicles a world untouched for centuries and struggling with profound change. Since joining the EU, Romanians are free to work as agricultural labourers and earn more in one month in Germany than a year at home in their traditional occupation, as shepherds. 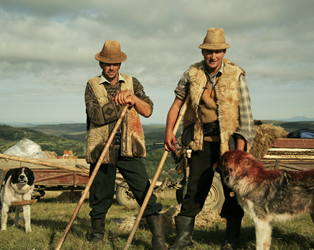 Off The Beaten Track follows a year in the life of Albin Creta, a shepherd from which country? Need a hint?